Grand entrance to the Park Avenue Armory. Image courtesy IFPDA. New York Print Week was boisterously back this year, with unprecedented numbers of visitors to the IFPDA Fair uptown, the revitalized E/AB Fair downtown, symposia, lectures and dozens of exhibitions in galleries public and private, stretching from the Lower East Side to Morningside Heights and beyond to the outer boroughs. 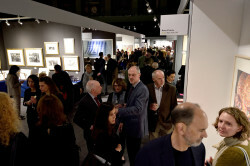 Serious, educational, smart and sometimes thrilling, the 23rd iteration of the IFPDA fair filled the grand space of the Park Avenue Armory for four warm (if damp) days, with 89 exhibitors, 10,000 visitors and tens of thousands of works of art, from Old Master engravings to works fresh off the press (with the occasional drawing and sculpture for good measure). Brisk sales were reported as of the opening night, which was also distinguished by Mike Bidlo’s recreation of Piero Manzoni’s 1961 performance Carte d’autenticità—willing attendees were signed, declared living works of art (of various duration), and given (appropriated) certificates to that effect. 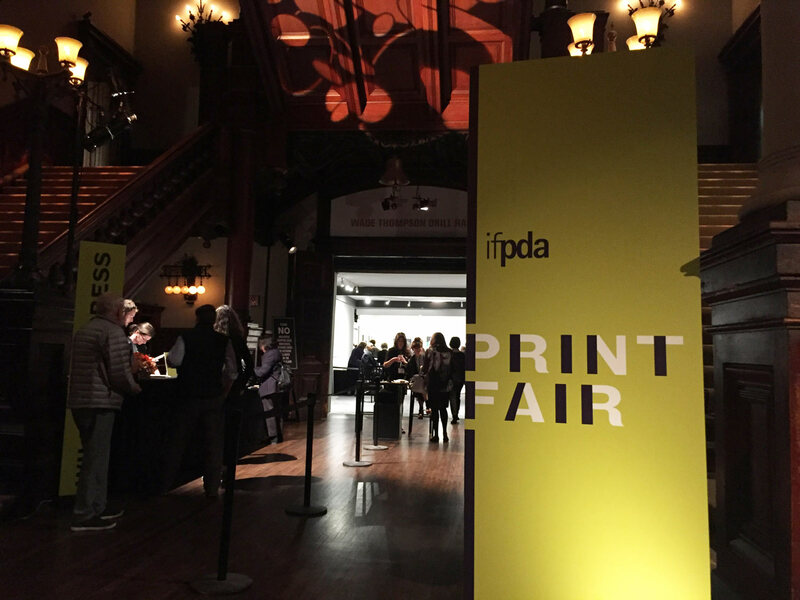 Opening night at the IFPDA Fair. Photo ©Steven Smith. 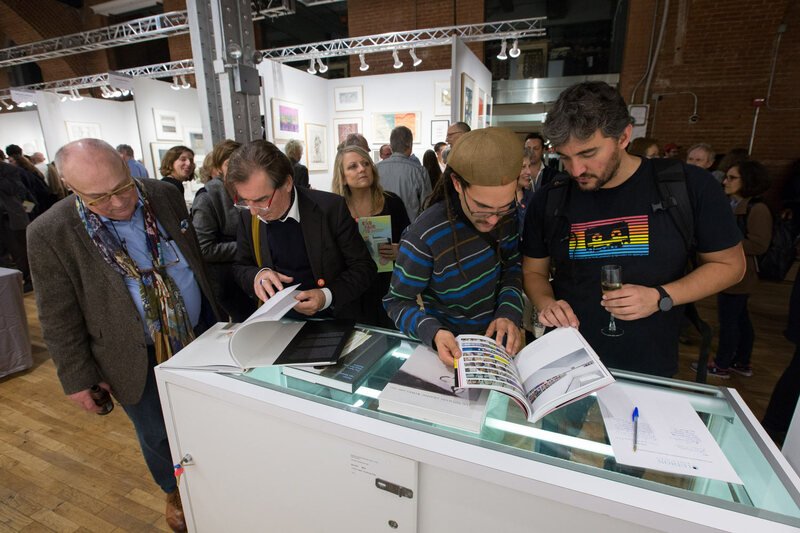 Newcomers to the fair included London’s Pauper’s Press, who showed subversively seductive work by Stephen Chambers, Mat Collishaw and Mai Thu Perret. Meanwhile, Old Master dealers such as C.G. Boerner and David Tunick were replete with rare states by Dürer and Rembrandt. Redfern Gallery’s display of rarely seen work from the 1930s by Anthony Gross was among a number of rewarding, mini-historical exhibitions on view. Livre d’artiste publisher Arion Press showed their new book, The Lulu Plays by Frank Wedekind, with new linocuts by William Kentridge, while Graphicstudio brought Ed Ruscha’s terrific book-portrait lithographs from 1970 along with a notably eccentric giant toy multiple by Trenton Doyle Hancock. Dolan Maxwell supplemented their specialty in the work of Stanley William Hayter with prints from Philadelphia artist Amze Emmons. Center Street Studio’s booth with new monotypes by Markus Linnenbrink. Image courtesy E/AB Fair. Photo: Gulshan Kirat. 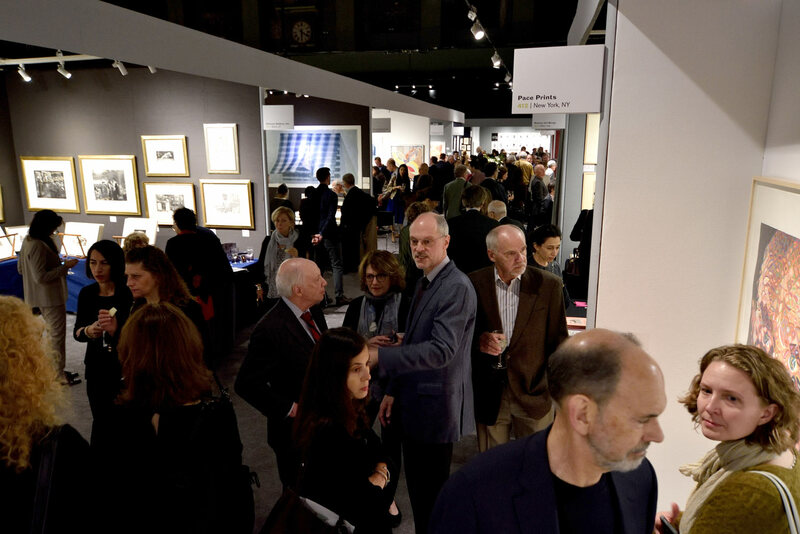 Spencer Finch’s large aquatint grid—a meditation on the chromatic universe of the Wizard of Oz—was a vivid presence in the Paulson Bott booth, while Durham press presented a weighty portfolio by Hurvin Anderson. Carolina Nitsch debuted Almanach 67, a dramatic suite of woodcuts by Tal R as well as a set of mysterious monoprints by Alexis Rockman filled with translucent dinosaurs, mammals, crustacean, insects and diatoms. New Baldessari editions could be seen at both Gemini and Mixografia. 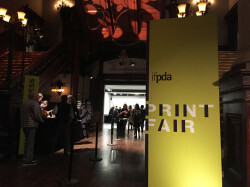 The E/AB Fair lived up to its reputation as the funkier counterpart to the IFPDA’s more formal demeanor, gathering more than 50 exhibitors in the old 1980s nightspot The Tunnel, now refurbished and sparkling. Coordinated by the Lower East Side Print Shop, this year’s fair was curated by Jeff Bergman, the Director of Pace Prints, and included book publishers and ephemera dealers, as well as eminent printshops such as ULAE and Harlan and Weaver. There were rare multiples, books and prints of all sizes and ambitions by artists such as Kiki Smith, Ryan McGinness, Mickalene Thomas and 2015 MacArthur Fellow Nicole Eisenman. 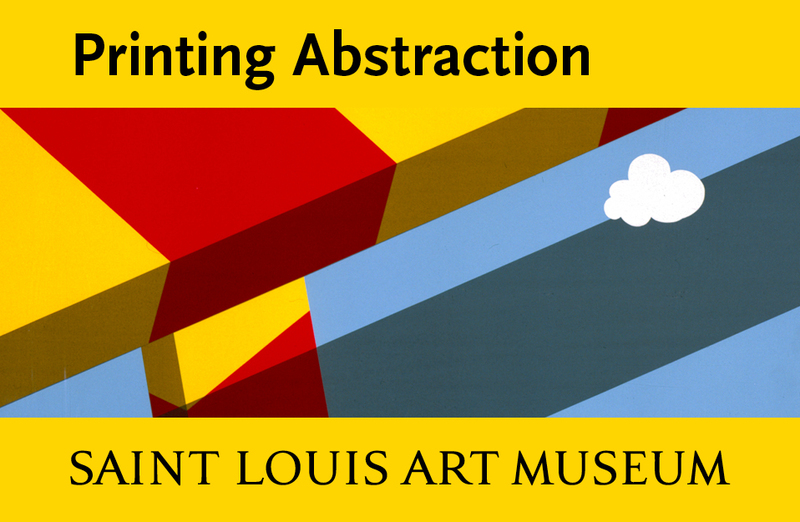 Participating printer/publishers included Aspinwall Editions, Bleu Acier, Center Street Studio, Oehme Graphics, Wingate Studio, Jennifer Melby and Baron/Boisanté & Om from India, among many others. 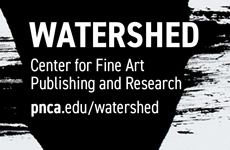 (Look for reviews of editions from these and many other printshops in the March issue of Art in Print.) Kayrock Screenprinting and Booklyn helped keep things lively. Recent books from Antwerp-based Ludion Publications. Image courtesy E/AB Fair. Photo: Gulshan Kirat. Greg Burnet showed an intriguing new Glen Ligon etching; the Graphic Matter/Ludion (Antwerp) booth included Luc Tuymans, a gripping new woodcut by Kerry James Marshall alongside beguiling wrapping papers by Barbara Bloom; while at Highpoint Editions (Minneapolis), Mungo Thomson’s enormously enlarged Time/Life Books covers garnered a lot of attention. Dutch publisher Johan Deumens returned to the fair with erudite editions from Annesas Appel, among others. 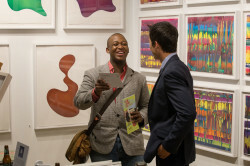 Together the two events continue to offer a place for established and emerging artists, print shops and dealers to connect with their expanding audience.